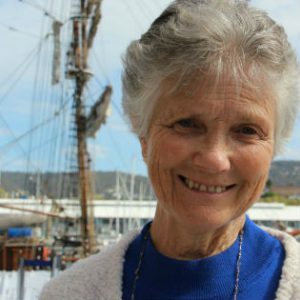 Sr Margaret Guy remembers a special time in a special place. I think our Congregation of Sisters of Charity has special bonds with Tasmania going right back to our history of the first three sisters — John Cahill, Catherine O’Brien, and Xavier Williams being invited there by Bishop Willson in 1847. I spent three years as a parish worker in Christ the Priest Parish, Kingston and consider my time very special and memorable. Although there were many challenges, I found the people very welcoming and faith-filled. Parish groups were very much alive, as were the Eucharistic liturgies. I felt very much part of the parish community. Being cut off from the mainland, I think we bonded more as an RSC community, which in my time was Mt Carmel, Sandy Bay, and Kingston. Mt Wellington always dominated the scenery, along with the beauty of the Derwent River and the city of Hobart. Many times I took visitors up that mountain and enjoyed snow times there by myself or with other sisters. Mt Wellington would have dominated the Cascade Female Factory and all those women imprisoned and suffering from hard labour (e.g. washing all the laundry with carbolic soap and often standing in water running down from the mountain). I did not visit this now heritage site of the Cascade Female Factory till years later on during the 160 year celebrations of RSCs in Tasmania and 175 years of RSCs in Australia celebrations and then again on October 14 morning before the Unveiling Event in the afternoon. This time impressed me more deeply. I seemed to learn more details of the daily life which these women and babies suffered and, as a result of which, many died. With the sculptures unveiled, I felt as though these life-like figures, Indiarna 19, Alison 36, Laen , 27 and baby Harry and the boy Toby were so real. What suffering and hardship were ahead of them!